Disaster Relief Support for Schools Affected by Hurricanes Harvey and Irma - If your school is in the areas affected by these hurricanes, you qualify for this expanded donation program. You will also be given expedited service to get the hotspots to you as quickly as possible. Affected areas which qualify for this donation program are listed on the FEMA Designated Disaster Areas for Florida and Texas. Refer to the FEMA maps for Florida and Texas. If you have questions please contact us at [email protected] or 866 344-7758. Important: If your organization is not in affected areas by the recent hurricanes, you must request one of the available standard products (single, Up to 5 or Up to 10 device donation programs) here. The Mobile Beacon donation program at Digital Wish provides free 3G/ 4G LTE mobile broadband hotspots to eligible public and non-profit private schools throughout the United States. The Franklin r910 hotspot is the model currently being provided as a donation (A retail value of $180 each!). Up to 26 hotspots available per school - Members can also choose to order 1 single hotspot or blocks of 5 or 10 hotspot modems. Click here to order. If your school exceeds the 26 device limit, please contact us at [email protected] to apply for a quantity extension. Device Replacement Program for Mobile Beacon Customers - This program is available to current Mobile Beacon subscribers only, whose organization is in a FEMA designated disaster zone. If your device(s) was damaged due to the recent natural disasters, we will replace your device free of charge, even if it is out of the warranty period. Click here to apply for a replacement. Organizations may apply for Mobile Beacon's donation once during the same fiscal year (July 1 - June 30) and receive up to 26 hotspots with subscriptions. 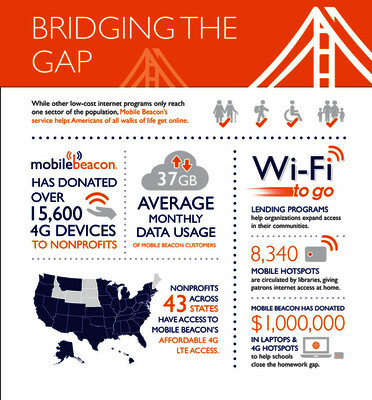 If you need devices beyond what is included through Mobile Beacon's device donation programs, additional 4G LTE devices can be purchased from Mobile Beacon at standard rates. There is no limit to the number of devices you can request, and Mobile Beacon provides free consultation to help organizations determine the best devices for their needs. A $130 administrative fee will be applied at checkout. * You will need to activate the $120 annual 4G LTE plan with Mobile Beacon for the donated devices you'll receive. Digital Wish will email you subscription codes and instructions. A school, organization or personal credit card is required to process your subscription service with Mobile Beacon. The hotspot modems will be activated and shipped to your school address. You will renew Internet service directly through Mobile Beacon. If you find that you need more mobile hotspots after the first year, you can return to Digital Wish and request more Mobile Beacon products. Organization email addresses required: All accounts require that email addresses must be affilated with the school, not a personal email address. 7. Do I need to order by June 30th? You can order at any time. Under this Disaster Recovery Program, we allow up to 26 devices per school per fiscal year which ends on June 30th. If you order your annual limit of 26 before June 30th, 2018, then you can get up to another 26 devices after July 1, 2018. If your school exceeds the limit and more teachers need devices or you want to set up a student Hotspot Lending Pool, you may apply for a quantity extension. Contact [email protected] to apply. 10.What happens if my hotspot is broken, lost or stolen?If your hotspot was damaged or lost as a direct result of the recent hurricanes, your hotspot will be repaired or replaced at no cost to you. Click here to apply for a replacement. For non-disaster situations, if your hotspot fails because of a defect, it is covered by a one year manufacturer's warranty. If you break , lose it or it's stolen, you will need to purchase a new hotspot from Mobile Beacon directly at $70/unit plus shipping and handling. Your service plan would be transferred to the new device and the old one would be deactivated. Important: Record the MEID number on the back of the hotspot and keep it in a safe place. You will need this number when contacting Mobile Beacon about issues with the devices.